Have You Registered For Bloody Words 2014 Yet? Once a year, Canada welcomes mystery and crime fiction writers and readers from all over the world for our annual conference, Bloody Words. This year’s conference is rapidly approaching and will take place in Toronto from June 6–8. 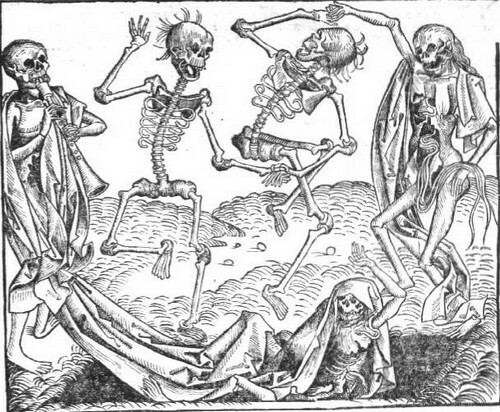 This year’s theme is ‘The Dance Macabre’, celebrating historical mysteries, but the conference isn’t solely about historicals—we’ll also celebrate everything from cozies to noir. This year’s guest of honour is well-known Canadian author Vicki Delany, the international guest of honour is Michael Jecks, master of the medieval murder mystery, and the Master of Ceremonies is the hilarious Melody Campbell. I’m already registered and looking forward to it, but why should you consider going? Attendees: This conference isn’t just for writers, but for readers as well. I remember going to my first Bloody Words in 2010, and being pleasantly surprised at the number of readers attending. They sat in on lectures on craft and forensics, attended the banquet, went to readings, and had a chance to meet new authors and reacquaint themselves with old favourites. Panels and sessions: For the writers in the group, the sessions are many and varied. There’s great information for the beginner on how to outline, write, edit or pitch, and for more experienced authors, there are sessions on career management or how to maintain a series. Agent and editor pitch sessions: Do you have a new manuscript you want to get into an agent’s or editor’s hands? No better way to be able to really talk about your book than one-on-one. Sign up for a pitch session here. Also, as an aside, pitch sessions aren’t the only way to talk to agents about your book. At my first conference, I was chatting with an agent before the banquet and she requested the full manuscript simply based on that conversation. So there are many opportunities to meet with industry professionals. Loot bags: Because who doesn’t love free stuff? Sunday morning workshops: Want to get into the real nitty gritty of writing a gripping novel? These extended sessions taught by knowledgeable writers are a great way to really dive into your craft. Manuscript evaluations: You can sign up to have your manuscript evaluated by an editor or published author who will give detailed feedback on how to strengthen your story. But hurry, the deadline for manuscript evaluation submissions is April 1st! See more details here. Books with Legs: If you want to have a great laugh and to watch me prance down a catwalk wearing a funny hat and a placard of A FLAME IN THE WIND OF DEATH, this is your chance. This Friday night event will be a fantastic (and no doubt hilarious) way to see attending authors highlight some of the best new fiction from the first half of 2014. Fashion show commentator Caro Soles will host the event and keep the audience in stiches. The banquet: This year everyone is invited to come dressed as their favourite mystery character, historical or contemporary. Now… where did I put my deerstalker cap? The dealers room: Want to pick up the newest book from that author you just saw on a terrific panel? The dealers room will be carrying books from attending authors as well as other reading-related items. The convenient location: Bloody Words is located this year at the Hyatt Regency on King Street in Toronto, right in the middle of the theater district. There’s a special conference room rate if you book before May 5th, so treat yourself to come a day or two early to see the city and catch a show before the conference fun begins. Don’t miss out—Register for Bloody Words 2014 today! Want to find out more? Follow @bloodywords2014 on Twitter, like Bloody Words 2014 on Facebook and always stay up to date at http://2014.bloodywords.com/! Its giveaway time again! Stop by Goodreads until Monday night at 11:59pm for the chance to win a signed ARC of A FLAME IN THE WIND OF DEATH. Enter here! It was a pleasure this past weekend to meet a living legend in the field of forensic anthropology ― Dr. William Bass. Dr. Bass is half of the writing partnership of Jefferson Bass (with Jon Jefferson), but in the world of science, his claim to fame is as the creator of the University of Tennessee’s Forensic Anthropological Research Facility, better known as 'The Body Farm'. Even though he has supposedly been ‘retired’ for 16 years, Dr. Bass is still an active part of the University of Tennessee (UT) and the research center he created. He’s very proud of his time at UT and stated that, as of that day, he’d been there 40 years, 1 month and 6 days. He started 'The Body Farm' in 1980 to increase scientific understanding of what happens to the human body following death with the direct intent of assisting in crime scene investigation. Over the years, he and his students have studied as many variables as possible ― outdoor surface vs. burial decomposition, indoor decomposition, insect infestation/maturation as an indicator of time since death, carnivore scavenging, chemical substances produced during decomposition, the effect of trauma on decomposition, race determination through computer analysis and much more. What started as a little known facility with only a few donations per year is now a major center for scientific investigation with more than 100 cadaver donations annually. After decomposition, all remains are finally stored at UT in what is now the world’s largest skeletal collection, the William M. Bass Skeletal Collection. Dr. Bass was the speaker for the opening session of Killer Nashville with a talk entitled ‘Bones Do Talk’. A very spry 83 (today is, in fact, his 83rd birthday), he was an immensely entertaining speaker, sharing his own personal stories from a varied and colourful career in academia and while assisting law enforcement. To illustrate his teachings, he brought along a box of ‘friends’ ― skeletal specimens from past cases. It was an interactive lecture, with members of the audience assisting with his case-by-case analyses. He led us through blunt force trauma slayings as well as piecing together a death scene and cause of death from a skull with three apparent bullet defects (the fourth defect was hidden as the bullet exited through the eye socket). He also included interesting facts on bone growth from infancy to adulthood, comparing a newborn femur to an adult femur to illustrate the process of growth ending in epiphyseal fusion to seal with growing ends of the bone to the shaft. From a personal standpoint, Dr. Bass has been my scientific companion through my writing career. I have binders full of his papers (and those of his students) that have been instrumental in allowing me to create crime fiction grounded in scientific truth. So, it was the highlight of the conference for me to sit through one of his lectures and a personal thrill to make his acquaintance. He’s a very friendly and gracious Southern gentleman who shows no sign of slowing down, no matter what his age. Clearly, he loves what he does and knows what a difference it makes, and will continue to do what he can to expand upon our knowledge and to bring the missing home.